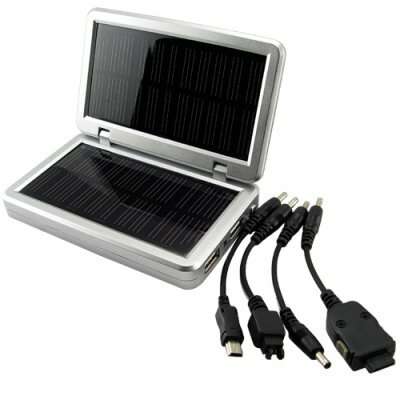 Successfully Added Solar Battery + Charger - Green Power for Portable Electronics to your Shopping Cart. Solar battery and charger that provides power for portable electronic devices such as cell phones and digital media players while you are out on the road. This portable battery and charger has a built-in high capacity battery pack for providing power for all popular portable electronic devices. This well designed dual-panel unit stores solar power or can even be recharged via a standard wall plug and is a popular extra power source for the person on the go or anyone planning an extended trip. The latest model in our series of solar power products has a 4-setting voltage adjustment switch to help you best select the power output for your portable mobile phone / electronics device and 2000mAh to provide plenty of in-need power. With a built-in USB slot along with connectors for common cellphone brands, this unit is capable of keeping your favorite products (mobilephone, MP3/MP4 player, digital camera) going all day long. If all that wasn't enough, this can also be used as just a regular backup power source. Once the internal battery is fully charged you can keep this in your car or backpack and use it whenever you want, day or night. While providing clean, cheap green power is its main strength, you will find that it can also easily be used as a backup battery for your camcorder or other high demand portable electronics product. This model has variable voltage/current output. on 2009-05-03 14:20:31 solar power is the way to go!! solar power is the way to go! !